I've never read anything by Tracy Chevalier- but have heard all her books are good. Might have to try one on audio! 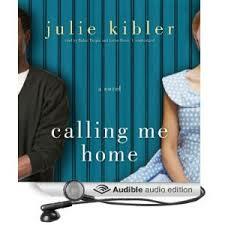 I've also heard good things about Calling Me Home and already have it on my TBL list! Kristin - I've read a couple of Chevalier's books and liked them, but this is the first time I've tried listening. Calling Me Home was SO good - hope you get a chance to enjoy it soon! Bella - It's a great book! My mother and sister both loved it, too. I'm a big fan of audio books too. 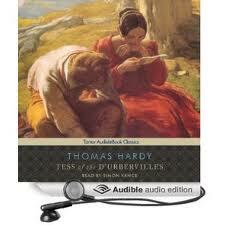 Glad you're sticking with Tess--audio is definitely a good choice for Hardy. I hope you do enjoy The Last Runaway--I really liked the narrator, thought she handled the various characters well. Thanks to your repeated mentions of the book, I have Olive Kittridge in the car, and will start it as soon as I finish a light, bright, and sparkling 5 story romp with PG Wodehouse. JaneGS - I am into the second CD of The Last Runaway and definitely hooked. Was wishing I had somewhere else to drive tonight. I hope you love Olive Kitteridge as much as I did. There was something about the combination of stories, characters, setting, and the narrator's Maine accent that really spoke to me. I remember borrowing a print copy from the library to reread several passages. Definitely an all-time favorite! Hmmm, I have The Last Runaway but haven't loaded it yet. I will look for your review! And OMG Lorna Raver was GANUSH in Drag Me To Hell!!!! I just figured that out! If you want to get a whole different side of Lorna Raver, you must watch that movie. I think my kids have seen it 30 times. I'll have to check out Calling Me Home--that looks like one I would like. Thanks for the recommendation! Too Fond - Calling Me Home has been my most recommended book so far this year. Hope you get a chance to listen. 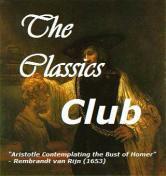 It's inetresting that some of the classics may be easier to listen to than to read. Glad you like the audio. Harvee - A good audio production makes classics much more approachable for me! I need to start making separate to-read and to-listen lists, since so many are just better in one format than the other. Carol - It's a slippery slope once you start that... my audio wish list is approaching 200! I think I only made it through the first chapter of Tess when I tried - maybe Simon Vance would help me make it through, too. 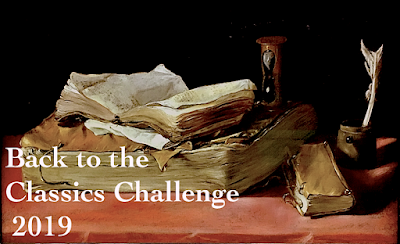 Kate Reading, Simon Vance and Orlagh Cassidy are all on my favorite narrators list! 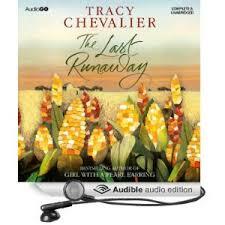 Nise' - I'm enjoying Kate Reading's narration of The Last Runaway! 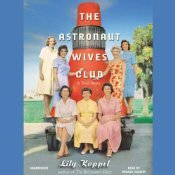 Oh, I can't wait to hear your thoughts on The Astronaut's Wives Club. What an interesting life those women were thrown into. Lisa - That sounds like such an interesting book! I also really liked Koppel's previous book The Red Leather Diary. Some new titles for me to add to my TBL list! I don't think I'll go for Tess yet, though. Dickens on audio first! 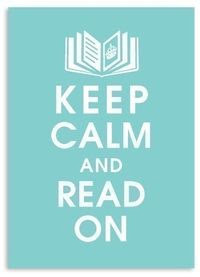 Laurie C- Simon Vance got me through Bleak House, too. That worked very well as a read/listen combination. The Astronaut Club sounds fascinating! I read Tess a few years back when the TV movie was on, just to compare. I found it very literary and philosophical, and enjoyed it a lot. Wonder how that translates into audio... don't you have to pay a lot of attention while listening to grasp what Hardy's worldview is (which I remember, is quite gloomy). Arti - With Simon Vance narrating, just about anything translates well to audio! I'm glad I decided to supplement my reading with listening this time around. Calling Me Home looks really good. I'll have to give it a listen! readingdate - Hope you get a chance to listen soon. Orlagh Cassidy is one of my favorite narrators - have you listened to her? Everyone raves about Simon Vance - I need to listen to one of his books. Any recommendations for my first? Colleen - I have not listened to Orlagh Cassidy, but have several of her books on my wishlist. I know she narrates the later Maisie Dobbs books (I'm so far behind) and I just added While We Were Watching Downton Abbey to my list, too. Simon Vance has become the voice of British literature for me. In addition to Tess, I loved his narration of Bleak House and have David Copperfield ready to go. He did an excellent job with China Road (nonfiction) and I also listened to him read Winter King (nonfiction). If none of those appeal, I understand he's done a marvelous job with Bring Up the Bodies by Hillary Mantel and The Girl With the Dragon Tattoo. Simon Vance is a great narrator! I also like Orlagh Cassidy. This week I'm discovering more and more good audios and narrators. Laura Fabiani - Discovering new audiobooks and narrators is my favorite part of Audiobook Week! I'm really bad about remembering the narrator's names but I have to say that this has been a great year for audio for me! I have you and Mary to thank for your incredible reviews. My wishlist is a bit out-of-control right now too but it doesn't stop me from adding more!!! Staci - I'm so glad you 're enjoying audiobooks!! My wish list is ridiculous, too, but it always helps when I'm choosing my next audio.